Java has an IO system that's really flexible for reading and writing data. If you keep NIO out of the equation, then data from an input source typically originates from an InputStream. However, most tutorials and mentors would recommend that you wrap this raw stream into something more appropriate for your needs. With text files, when you want to inhale in Strings (XML falls into this category), you frequently see examples of an InputStream being wrapped up sequentially into a BufferedReader. So, do these abstraction layers for IO impose a penalty on performance? I reused my big file (USA.txt) and set up a benchmark run with a BufferedReader. 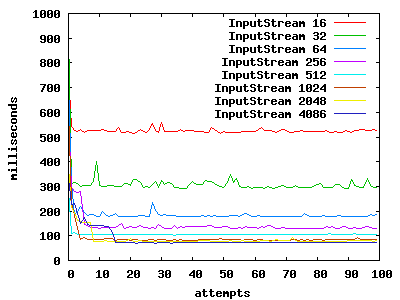 The chart shows the performance of 100 runs of the code. It's pretty stable and hovers somewhere between 80 to 100 milliseconds. 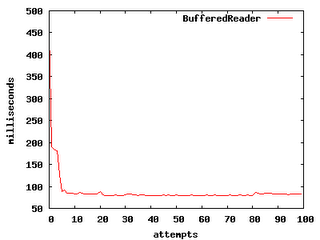 As we ratchet up the buffer size, we see performance gains. However, these gains steadily diminish. 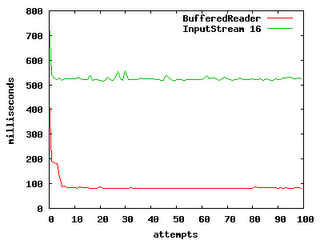 The most notable detail is that there's no point at which the InputStream read outperforms the BufferedReader. 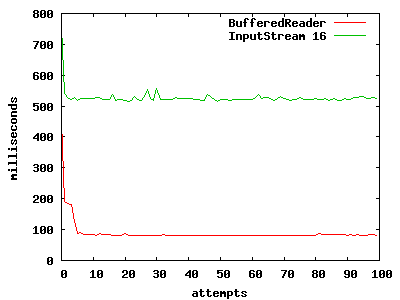 Behind the nice and friendly methods that the BufferedReader provides, there's clearly a huge amount of cool code that bridges the Reader to the InputStream. The cute parts that figure out the best way to read seem to be hidden, and working. Spend some time reading through performance myths (from the pros), and there's one constant that shows up consistently. Keep it simple. The VMs do a lot of hard work for you, so you can write code that is clean. And, clearly this simplicity doesn't impose a performance burden here. Nifty. operations performed. The end result is faster, more efficient I/O. 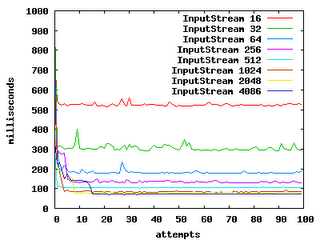 The same reasoning stands for improving performances in the input stream test u ran. The increasing of the buffer size led to the same behaviour as defined above. read 8-or-more bit characters, translating them into 16 bit Unicode. You're allocating new strings in the while loop of the InputStream code. That can cause a significant performance overhead, because you have to create a bunch of new objects. but what did you use for the benchmark? Thanks, It's great help to me. Good luck.